Omar has been on staff for two years now at Church of the Highlands, serving as the Inertia Youth Pastor. His burning passion is for evangelism and making Christ known to people both young and old. He enjoys reading the Bible and reads through it every year. He was also recently recruited as the full time facilities director for Highlands Christian Schools. This busy pastor worked for Comfort Systems USA for 23 years prior to joining the school and the church full time. His company is the nationwide leader in providing commercial HVAC design, mechanical and electrical services to small businesses as well as top fortune 500 companies. With a 1.9 billion annual revenue, Comfort Systems USA takes pride in being awarded one of “Forbes America’s Most Trustworthy Companies” four years in a row from 2014 to 2017. After graduating from Highlands Christian Schools, Omar went on to El Camino High and was in many advanced classes. He credits HCS for equipping him academically, particularly in Math and English. 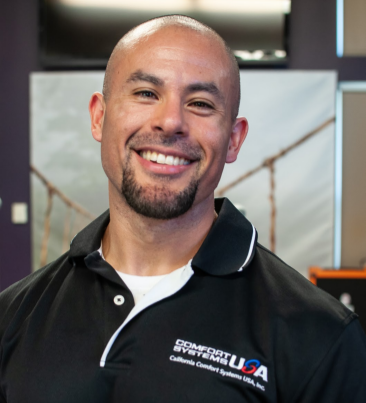 He graduated El Camino High in 1993 and took some classes in Kinesiology prior to moving on to Trade School, which his previous company partially subsidized. “Throughout that time I knew I was rebelling against God, but I did not care. It wasn’t until the Lord brought me to my knees through a traumatic experience in 2003 that I remember being just brought low in life. I cried out to the Lord and He saved me. It was a burden lifted off of me. It was like having a 200 pound backpack on you walking through life and the burden was heavy, and you try to mend on your own but then someone comes and takes it off of you and you feel light and alive. That is how it was when God brought me to my knees to humble me… It was then that I remembered everything I was taught and I asked God to forgive me and He did.” Two weeks after coming to Christ, Omar found out that he had an aggressive form of cancer called Large B Cell Lymphoma and began seeing doctors from Kaiser and Stanford. During this time he lost about 60 to 70 pounds and was quickly deteriorating physically. Many people were praying for him and he felt the amazing peace that can only come from Christ the peace that surpasses all understanding. He knew for the first time in his life with conviction and confidence that if he were to die from cancer that he was going to go to heaven. Prior to that he says, “ I knew where I was going; I was going to hell, because I was rebelling against God and I did not care. ” One decision, however, changed his eternal destination. After going through seven surgeries and just before starting chemotherapy, Omar’s doctors took xrays, MRI’s and many other tests, but they could not find any trace of the cancer. “God healed me!” he told his doctors without hesitation. True enough, he was healed spiritually and physically! Hallelujah! It has been about 15 years since Omar made the decision to surrender his life to Christ and has been cancer free. He continues to serve the Lord faithfully today raising and mentoring his own family of four kids, as well as the youth in the congregation. He will be the first to say that even with life’s trials and struggles that come his way, his life with the Lord today is infinitely better than life without Him. Omar’s story is one of many amazing stories of how our Abba Father pursues us with His relentless love, of how our Redeemer can transform lives, and how Almighty God can use us when we put our lives in His all powerful and loving hands. If you are a Highlands Christian Schools Alumni with a God story to share, we would love to hear from you! Reach out to us at alumni@highlands.us and have your story featured here.